If you need your security gate serviced or repaired, Tulsa Home Guard can help! We offer commercial and residential gate maintenance and gate repair anywhere in Tulsa or in the surrounding communities. We understand how important your security is to you. 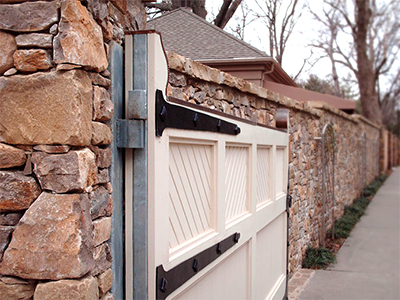 The experienced technicians at Tulsa Home Guard are able to repair your gate quickly and efficiently, no matter what the issues are with your gates! We are able to get specialized parts in a timely manner if they are necessary, and we will work our hardest to ensure your gate is functional as soon as possible! We also perform regular gate service maintenance on gates, both for businesses and for homeowners. No matter how strong or high-quality your gate is, it should have regular service maintenance to ensure its optimal performance. Some companies recommend annual service checks on their gates to maintain the best working conditions, as fasteners and other gate hardware can slowly become misaligned or rusted, and electrical components can deteriorate over time. help ensure that the manufacturers warranty remains valid. Our staff of trained repair technicians has been serving the greater Tulsa area since 1980, and we are qualified to work with all types of security gates, entrance gates, access control systems, and automatic gate openers. Contact Tulsa Home Guard today at 918-584-4923. Let us help you get your gate repaired and your security restored! Tulsa Homa Guard built and installed the custom gate for our ranch. I can tell you that it was a pleasure to work with them. They answered my questions, were easy to work with, and delivered a beautiful gate that works great! I love the look of our new gate, and it’s a relief to know we have that level of security. Tulsa Home Guard was on time and did what they promised. I couldn’t have asked for more. We take great pride in our family owned business which was started in 1980. We have built our business from the ground up and have enjoyed serving the Tulsa and surrounding communities.